The Veterinary Diagnostic department at NOACK provides a comprehensive range of test systems for detection of infectious diseases in farm and companion animals to customers in Central and Eastern Europe. Today NOACK is able supply tools for detection of most of listed diseases including the increasing number of emerging diseases, non-listed diseases impacting the livestock production and animal diseases with zoonotic potential. The collaboration with international well-known manufacturers of veterinary diagnostics allows NOACK to serve state laboratories, private laboratories, research institutions in the veterinary field and Universities with state of the art products based on ELISA and PCR techniques, reagents for serological techniques, animal genotyping reagents panels for improving the breeding stock and diverse Laboratory equipment. Our team implicates Veterinarians, Biologists, Biotechnologists and Food Technologists for giving the best possible support in the Laboratory and in the field. 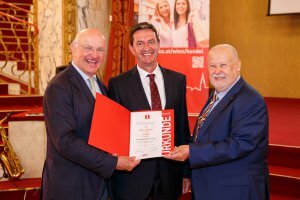 35th anniversary – Membership of Noack & Co. GmbH at WKO On June June 06th 2018, the Vienna Federal Economic Chamber…..